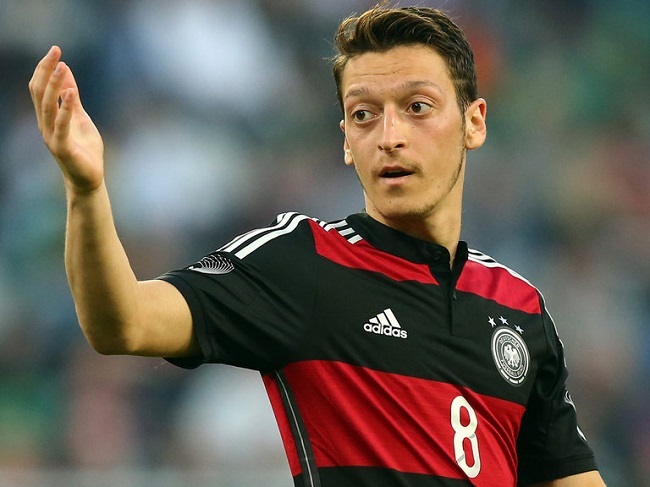 Germany’s Mesut Ozil is one of the World Cup’s star attractions. Starting this weekend, more than one billion Muslims around the world will begin a month-long period of fasting, spiritual reflection and religious study known as Ramadan. In Brazil, that includes several Muslim soccer players whose teams are among the 16 still vying for a World Cup championship. Two squads considered favorites to win the Cup are headlined by Muslim superstars: Sensational striker Karim Benzema for France, and midfield magician Mesut Ozil for Germany. Switzerland’s top goal-scorer is Muslim forward Xherdan Shaqiri. Belgium starts at least two Muslim players, teen phenom Adnan Januzaj and veteran Marouane Fellaini. Algeria as a country is over 95 percent Muslim, while Nigeria is about 50 percent Muslim, and their soccer teams are thought to be an accurate representation of those demographics. A handful of other Muslim players are believed to dot the French, German, Belgian, Swiss and Dutch rosters. In other words, the potential impact of Ramadan on the World Cup is not insignificant or to be ignored. Some VIPs (Very Important Players) could be taking the pitch in these upcoming matches feeling the effects of abstaining from food and drink during daylight hours, as Muslims are required to do during the holy month. That will certainly take a physical toll on athletes who are playing a grueling sport in Brazil’s hot temperatures. And it’s not as if they’re all used to it; this is the first time since 1986 that the World Cup and Ramadan have overlapped. Welterweight boxer Amir Khan recently passed on an opportunity to fight Floyd Mayweather Jr. and earn a career-best payday because the bout would have been scheduled for early September, which Khan said was too soon after Ramadan (about two months) to get in his best shape for a match. So imagine what World Cup players will be going through during Ramadan if they are fasting during a period in which being in excellent condition is preferred. There are, however, exemptions from fasting that athletes may exercise during the World Cup. If an individual is traveling, for example, he does not have to observe the fast if he does not choose to; he’ll just have to make up that day or days he skips after Ramadan. The important part is that the decision to fast or not to fast is left to each athlete, and no one else. While I’m pretty sure most national team managers and officials are smarter than, say, Donald Sterling, and know better than to publicly criticize a player for practicing his religion or publicly try to influence his decision, you never know what happens behind the scenes. And any Muslim athlete that has fasted before knows the effects it can have on their body and knows the risks involved — including the risk of getting less playing time if they’re not performing at their best or even if their fitness is just in question. Yaya Toure, arguably the best Muslim soccer player in the world and a star midfielder for Manchester City of the English Premier League whose Ivory Coast team was eliminated in the group stage, said before the World Cup that he would not fast during the tournament if his team was still in it. “Fasting? Have you seen the weather? I would die,” Toure was quoted in The National, a United Arab Emirates publication. While Toure won’t have to worry about it, several others will. And however Benzema, Ozil, Shaqiri and the rest of those Muslim brothers decide to handle Ramadan during the World Cup, may Allah guide them on their path.